Hard work and a great attitude are two key components to being a successful swimmer, but taking care of you body with healthy nutrition and preparation and also provide huge dividends. This page is dedicated to giving swimmers the tips to keep themselves in great shape and properly fueled for meet day. One of the most overlooked sources of carbohydrate is fruit. Yes, FRUIT. Fresh, canned, frozen, dried or juiced. 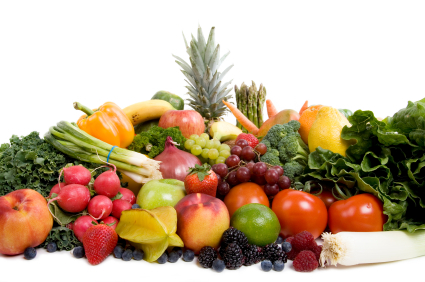 No matter how you look at it, fruit is an excellent source of carbohydrate. Not only does fruit provide carbohydrate in the form of natural sugars (versus refined sugar), the bright colors of fruits indicate that they are also excellent sources of vitamins and minerals, including a sub-group called anti-oxidants. You might recall that exercise is the stimulus that leads to training adaptations. And that adaptations to training occur ONLY is you give the body the right kinds of fuels during periods of rest. Well, one of the side effects of exercise is the generation of “free radicals.” Free radicals are molecules that can actually cause damage to muscle tissue above and beyond the damage caused by exercise. The damage caused by exercise is normal. It serves as part of the stimulus for training adaptation to take place. But damage caused by free radicals is NOT a desired part of the training process. Damage caused by free radicals (aka “scavengers”) circulating in the bloodstream after workout can continue well into the recovery period. This is when the body is supposed to be adapting! Anti-oxidants “absorb” free radicals, neutralizing their effect in the body before their damage to muscle tissue can amount to much. A diet consistently rich in fruits (and other colorful foods, such as VEGETABLES) is apt to keep the body consistently supplied with anti-oxidants, which will assist the body in keeping free radical formation to a minimum. This a good reason to eat lots of colorful foods during the recovery time between workouts. #1 priority is to Hydrate Hydrate Hydrate. It's a long day in a warm building and you need plenty of fluids to keep your body going. Don't be fooled by fancy shmancy energy drinks, good old water works best. Drink slowly but steadily throughout the day, and start well before the meet itself. If you are thirsty you are already dehydrated. What's not good to eat? 1. Go to sleep! Your body needs plenty of rest so get to sleep early and use Tivo so you can catch up on TV later. 2. Visualize your races. Picture what your perfect race will look and feel like. If you can think it, you can do it. 3. Be mentally prepared. Be ready for the long day and excited yu are a part of it. Do not let any negative thoughts go through your head and be ready to compete in top form!